Cheesy, delicious funeral potatoes: a holiday staple! 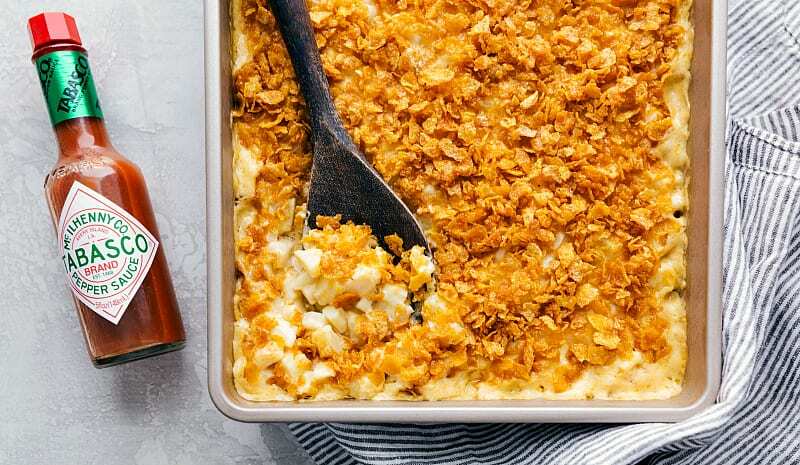 These made-from-scratch funeral potatoes are delicious and simple to make. Serve these funeral potatoes alongside this watergate salad, a quinoa salad, or these roasted brussel sprouts. I’m excited to be partnering up with TABASCO® Brand this year to bring you delicious recipes, including these Funeral Potatoes. As always, all opinions are my own. As a Utah native I’m well accustomed to funeral potatoes. While often served on a holiday table, you’ll also be sure to find them at just about any gathering of people in Utah. 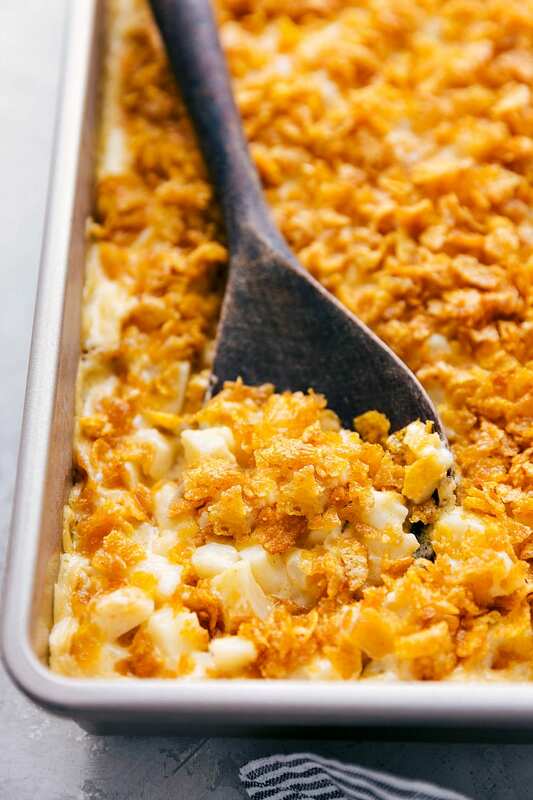 They’re pure cheesy comfort food — packed with potatoes, cream, cheese, spice, and a delicious crunchy topping: cornflakes! This may not sound the most appetizing for those unfamiliar with the dish, but trust me, it’s worth a try. They’re surprisingly delicious! 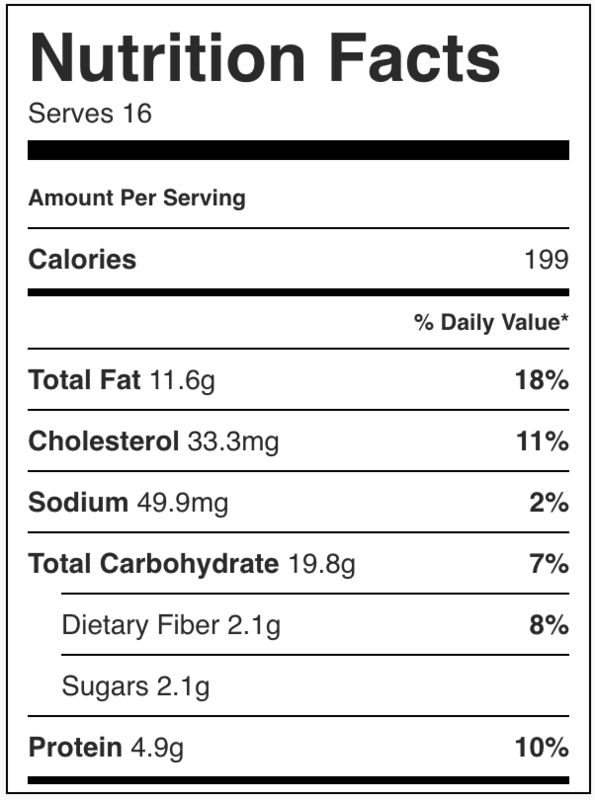 No wonder they’re a Utah staple. Why do they call them funeral potatoes? Funeral potatoes get their name from their association with funerals. Being the ultimate comfort food and easy to prepare and transport, funeral potato casseroles are a popular dish to bring to gatherings after funerals and other potluck events. The are also sometimes called “church potatoes” as they are a popular dish at various religious get-togethers, particularly throughout Utah and the Midwest. So now that you know what these funeral potatoes are, let’s talk about the process for making them! How do you make cheesy funeral potatoes? This recipe calls for a good amount of milk, cream, sour cream and cheese. Together these ingredients create a creamy and cheesy flavor that is irresistible! Add in some TABASCO sauce and a few spices and you’ll have a deliciously flavored potato casserole! Start by peeling and dicing your potatoes. The potatoes will get parboiled (partially cooked by boiling) which helps them cook evenly and quicker in the oven. 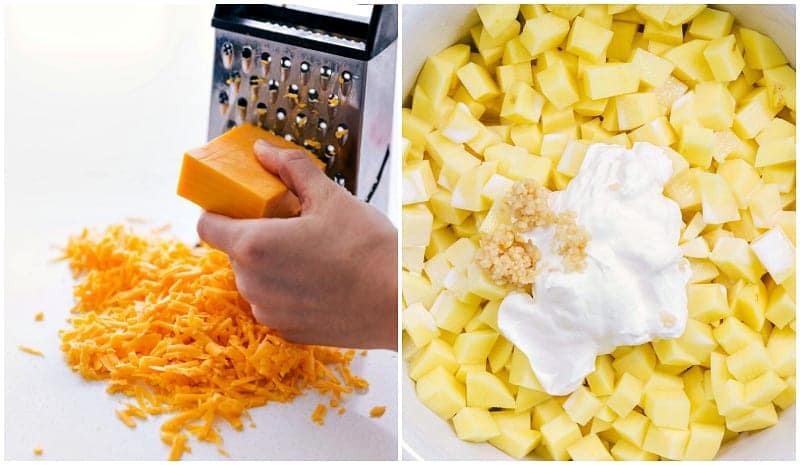 Mix together the rest of the casserole ingredients: Stir together the milk, cream, sour cream, garlic, thyme, salt, pepper, TABASCO sauce, and cheddar cheese. 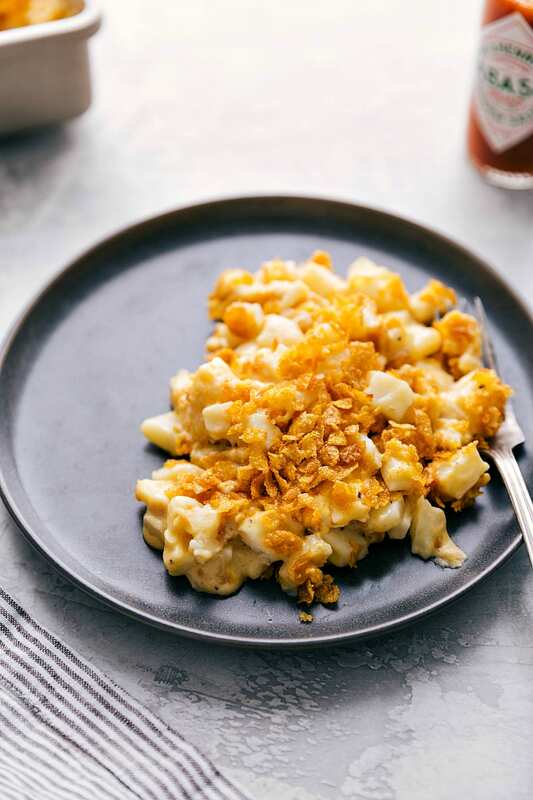 You can use a mix of different cheeses, but typically funeral potatoes are made with sharp cheddar cheese! Stir everything together and transfer to a 9 x 13 pan and bake. Add the topping: mix crushed cornflakes with butter and add to the top of the casserole; bake again! 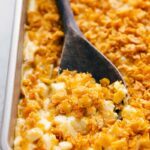 While cornflakes are the traditional topping of funeral potatoes, Panko or breadcrumbs work just as fine on top of this potato casserole! What temperature do you bake funeral potatoes? This funeral potatoes recipe calls for the oven to be set at 350 degrees Fahrenheit. 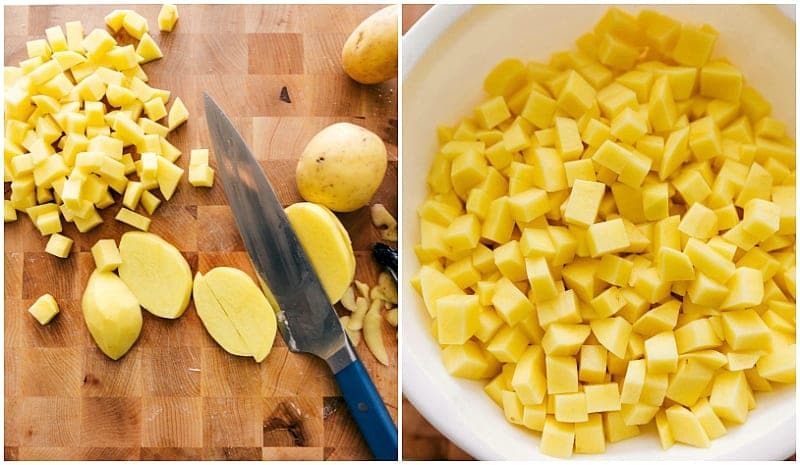 This will get your potatoes tender on the inside and create a perfect crunch on the top. Use fresh, Yukon gold potatoes. This will improve both the flavor and the texture of the dish. Many funeral potato recipes include onions. I personally feel like onions always take away from funeral potatoes, but if you like onions feel free to add in one small yellow onion. Make sure to first finely dice it and second saute until tender before adding it in. Thanks to TABASCO Sauce, these potatoes are packed with flavor and spice. The TABASCO sauce enhances all of the flavors and gives a great spice to these cheesy potatoes. Be sure to bring the bottle along so people can add it according to their personal preferences. Funeral potatoes do not store well with the cornflake topping on top. However, the base casserole stores well for up to 1 week. If you have leftovers, scrape off the topping and simply add a new topping once you’re ready to eat the leftovers. These funeral potatoes also do not freeze well. You can halve the recipe into a 9 x 9 inch baking pan if the 9 x 13 pan will be too much! ENJOY! Cheesy, delicious funeral potatoes: a holiday staple! These from-scratch funeral potatoes are delicious and simple to make. 1 and 1/2 teaspoons TABASCO Sauce, increase to personal preference up to 1 tablespoon! Stir to combine and pour into a 9 x 13 inch metal baking dish. Cover with foil. I’ve never heard of funeral potatoes before! This looks so good though! I have to try them for dinner this weekend, thank you!